Wallaby James O'Connor is an immensely talented versatile back but his off-field ill-discipline is threatening to derail a very promising career. O'Connor became the second youngest Wallaby in Australian rugby history, behind only Queensland wing Brian Ford in 1957, when he made his Test debut against Italy in 2008. He made his first start in green and gold against the Barbarians at Wembley later that year. Born in Australia, O'Connor grew up in New Zealand. A junior league player, in the league hotbed of Te Atatu, his first rugby experiences came watching the Blues at Eden Park before a move back to Australia gave him a start in union. A hat-trick of tries against Italy in Australia's opening Test of 2009 increased his stock further and paved a way to further honours during the 2009 Tri-Nations. Following an injury to centre Stirling Mortlock, O'Connor got a run in the side for the first time, but endured a difficult return to Eden Park against the All Blacks. 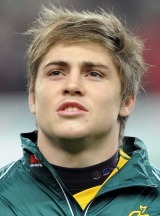 He was included in the Wallabies' end-of-year tour party but made only replacement appearances for the Test side. Come 2010, while he began the international season at fullback, he was moved out to the wing by head coach Robbie Deans for the Tri-Nations. The move worked out well for the elusive, fleet-of-foot O'Connor, who ended the campaign with four tries in his final three games. He also crossed the line during a famous win for the Wallabies over New Zealand in Hong Kong later that year, scoring a try to level the scores before stepping up to seal the win with a brilliant conversion. Following the 2011 Super Rugby season, O'Connor announced he would join the Melbourne Rebels for the 2012 campaign and would later be joined at the Rebels by fellow Wallaby back Kurtley Beale. O'Connor missed out on the Tri-Nations-clinching 25-20 victory over New Zealand through suspension after going AWOL and failing to attend the official World Cup squad announcement. However, he returned to the squad as a replacement for Australia's opening game against Italy and then regained his starting place against Ireland. O'Connor went on to perform well for the Wallabies as they finished third overall in the World Cup. Following the tournament, he impressed at fly-half for Australia against the Barbarians in their end of season tour and looked set to retain the No.10 jersey for the opening Test of 2012 with Quade Cooper recovering from a knee injury, but a lacerated liver suffered on Super Rugby duty sidelined him for six weeks at a key stage of the season. He missed their end-of-year jaunt to Europe but played a prominent role in against the British & Irish Lions the following summer. However, reports of Beale and O'Connor being photographed in a fast food outlet in the early hours of the morning in the run up to the second Test dominated the news agenda. Following the Wallabies' loss to the Lions, with O'Connor playing at ten, new coach Ewen McKenzie opted to switch him back onto the wing for the 2013 Rugby Championship where he seemed to be a more natural fit. But O'Connor's off-field ill-discipline let him down again as he was ejected from Perth Airport the Sunday after their win over Argentina with reports suggesting he was intoxicated. This proved to be the final straw for McKenzie who threw O'Connor out of the squad for their final two matches of the Championship.